Big thick slices of sweet ginger lightly sprinkled with sugar that melt in your mouth. Excellent homeopathic remedy for motion sickness! It also makes a super topping for ice cream! 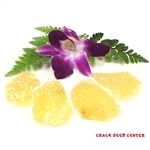 Try our Li Hing Mui Ginger for another sweet type of ginger.